Innovative tread pattern minimizes stone retention providing excellent retreadability. 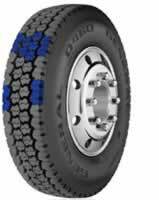 Closed shoulder tread design promotes even tread wear. Advanced tread compound for long mileage.